Dr. Weissman and Dr. Vipond not only offers effective treatments for your cosmetic needs but also the most effective skin care products to enhance your experience. 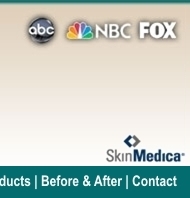 All though we have many complete product lines we are showcasing Skin Medica and Kinerase products. These brands have been featured in many different media outlets and hold a “Gold-Standard” in skin care. This unparalleled anti-aging serum is the first to combine the renowned growth factor serum, TNS Recovery Complex in one chamber and APS Corrective Complex™, a potent mixture of antioxidants, peptides and other innovative anti-aging ingredients, in the other chamber. Together these products work synergistically to transform and regenerate your skin for a more youthful appearance. Dermal Repair vitamin enriched facial cream intensely hydrates and replenishes dry skin with antioxidants and hyaluronic acid. Dermal Repair skin cream helps to reduce the appearance of age spots as it provides skin protection against harsh environmental conditions. Generates rapid filling and smoothing action to visually reduce the appearance of fine lines and wrinkles around the mouth, eyes, and crow's feet while providing long term anti aging benefits. Visibly smoothes the appearance of fine lines and wrinkles in forehead furrows, frown lines and crow’s feet and has an immediate lifting effect. A clinical study confirmed quantifiable improvement in the appearance of fine lines, skin tone and radiance. In addition, based on a consumer evaluation, 84% of women reported smoother skin. Get younger-looking skin in only 28 days! If you loved our Peptide Intensive Treatment, try this next generation product. This powerful yet gentle formula has been clinically shown to conquer damage at every level, restoring your skin's delicate beauty. Uniquely formulated utilizing only the finest pharmaceutical-grade ingredients, triple-milled high-pigment minerals, and an advanced antioxidant complex of Vitamins A, C, and E and green tea extract, glōminerals provides broad-spectrum UV protection and helps to defend against free radical damage, to deliver a radiant, healthy complexion. In addition, glominerals formulas are talc-free, non-comedogenic and free of perfumes and chemical dyes, making them suitable for even the most sensitive skin types, including those with acne and rosacea. Copyright © 2008 Dr Glenn H. Weissman, M.D. Facial Plastic Surgery. All rights reserved.